Meet the Holly Markt/Jenn Deer Team! They have been marketing and selling homes in the Myrtle Beach area for a combined # of 31 years. Jenn and Holly are full time Realtors and love what they do. 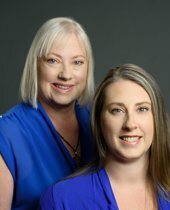 They are a Mother/Daughter premier real estate team! They moved to South Carolina after living in CT, NJ, and PA. They do not miss the cold! The weather in this area is beautiful! We have many more nice days than not! Property taxes for primary residents are much lower than what they paid in the prior states that they lived in. So great weather, low taxes, and nice people…these are just some of the reasons that people move to South Carolina. Beach, golf and shopping are also great incentives to move here! Jenn and Holly are very involved in the community and their real estate board, Coastal Carolina Association of Realtors. They have been or are involved in committees including Legislative, Grievance, Professional Standards, Community Outreach, and Young Professionals. Staying connected to what is happening in your own neighborhood is important to them and to their clients. Training and Education in real estate is something that they also do. Jenn and Holly both take classes on a regular basis and will travel to do so. Networking with other real estate professionals is a great way to make contacts that help their clients sell their current homes and enable them to move to the beach! Ask them for help! They will be happy to assist! So come move to the beach! Call either Holly or Jenn! They will be glad to tell you what they love about living in this beautiful area and also will be happy to help you find your forever home! I have nothing but great things to say, working w Holly Markt was wonderful. She was VERY knowledgeable on the properties we wanted to look at, easy to talk with, on time, and made the whole process a snap. Thanks to her, I not only bought a great property, we already have it up and renting less than a month after closing. Will and have recommended BRG and Holly to others. Great people!!!!!! Holly did an outstanding job for us. She is a true professional and an asset to your company. Holly was a great help before and during our endeavors with the real estate in SC. Our first foray into house hunting was well over a year ago. We came to the area not knowing what we wanted or where we wanted to be. Someone recommended Holly Markt to us. With her knowledge of the neighborhoods and the area she expertly guided us until we found the right home for us. She has the right mix of professionalism, knowledge, sense of humor and most of all, patience. She needed all of those attributes with us! Now that the paperwork is all done, and the house belongs to some else, I wanted to take the time to thank you again for all the assistance that you gave us during the process. Selling a house remotely, can be a nightmare, but you stepped in and made sure that all the little (and some not so little) things got done. We relied on you, and trusted you every step of the way. I can't imagine what this process would have been like without you on the other end. You have got to be one of the best at what you do. If we are ever in the market for something in your area, I will be sure to contact you. Holly and Jenn were excellent to work with. They always kept us updated on the progress as it was happening. Great team, love working with you.